I don’t know about you, but I run on coffee. Generally, I brew it at home, but sometimes it’s nice to get out and sit in a coffee shop for a while. Since the day it opened, Fuel has been my go-to coffee shop in Lafayette. Located near 10th and Main, it’s a convenient walk when I’m running errands downtown or an easy drive if I’m coming from home. With a long and narrow dining area, Fuel has always felt cozy to me. The soft cushions on the chairs help, and so does the stack of board games available to play. It’s just as fitting to see a parent and child playing Battleship as it is to see a student working away on their laptop. But whatever they’re doing, they’ll be drinking coffee (or tea). Fuel serves coffee roasted here in Lafayette. You can buy the beans whole, get drip coffee, or get one of the variety of coffee drinks on the menu. My favorite is the Dirty Ivan — a mix of espresso, steamed milk, and raw sugar. It’s delicious and energizing, but I don’t recommend having two in one day. Although coffee is the focus at Fuel, it happens to have a tasty food menu as well. The baked goods are always worthwhile, and the sandwiches box up well for when you’re on the go. 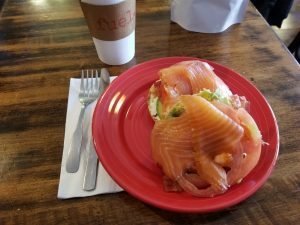 But I’ll let you in on a secret: the best thing to get is a bagel with cream cheese, avocado, tomato, bacon, and smoked salmon. Each of those add-ons bumps up the price a bit, so this turns out to be a fairly expensive option as far as bagels go, but it is absolutely worth it. When the weather is nice, the benches out front make a great place to sit and enjoy a cup of coffee as you watch the city go by. And the WiFi is free year-round.